A beautiful swimming pool is the crown jewel of any house. It’s a very good place to have barbecues, or pool-side parties and hang around with friends. Swimming is a great exercise for your family. To have a healthy and clean pool for all the daily swims and occasional parties, cleaning regularly is the only way. There is a variety of equipment in the market to help with the same. Pool Vacuums help us to remove dirt and debris that has settled at the bottom of the pool and help maintain clear water. Based on the customer reviews, we have the best pool vacuum heads options available for you in the market. This Milliard Sea-Thru Triangle Weighted Pool and Spa Vacuum Head is one of the best pool vacuum cleaners available in the market for the inground swimming pool. The handle has locking clips that spring-loaded which are very useful for attaching extension poles. This vacuum head fits 1.5’ and 1.25’ standard hoses. The triangle head is sea-thru and is efficient in vacuuming along the walls and corners. The rubber bumpers prevent damage to the vinyl pool liners. The 11’ vacuum head for vinyl pools is molded from ABS plastic for durability. 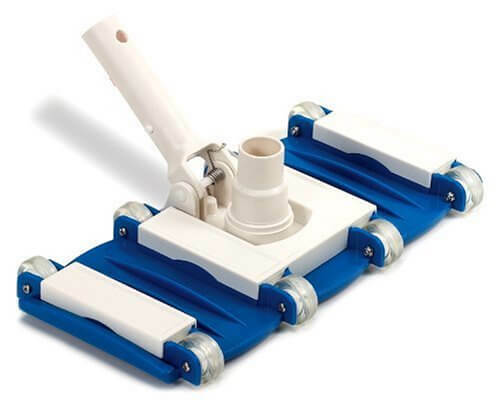 Swimline 8150 Weighted Flex Vacuum Head is an extra- wide 14 inch weighted vacuum head for concrete pools. The weighted vacuum head keeps the head firmly on the ground where it belongs and helps it to stay submerged. The special Snap-Adapt handle that comes with this Weighted Flex Vacuum Head is easy to assemble. The head fits a standard 1.25’ and 1.5’ vacuum hoses. The Milliard Extra-Wide 19" Heavy-Duty Flexible Pool and Spa Vacuum Head with Ball Bearing Urethane Wheels is one of the best pool vacuum cleaners available. The super-durable and flexible plastic body is made of ABS plastic. The molded urethane wheels keep the vinyl liner vacuum floor from getting damaged. 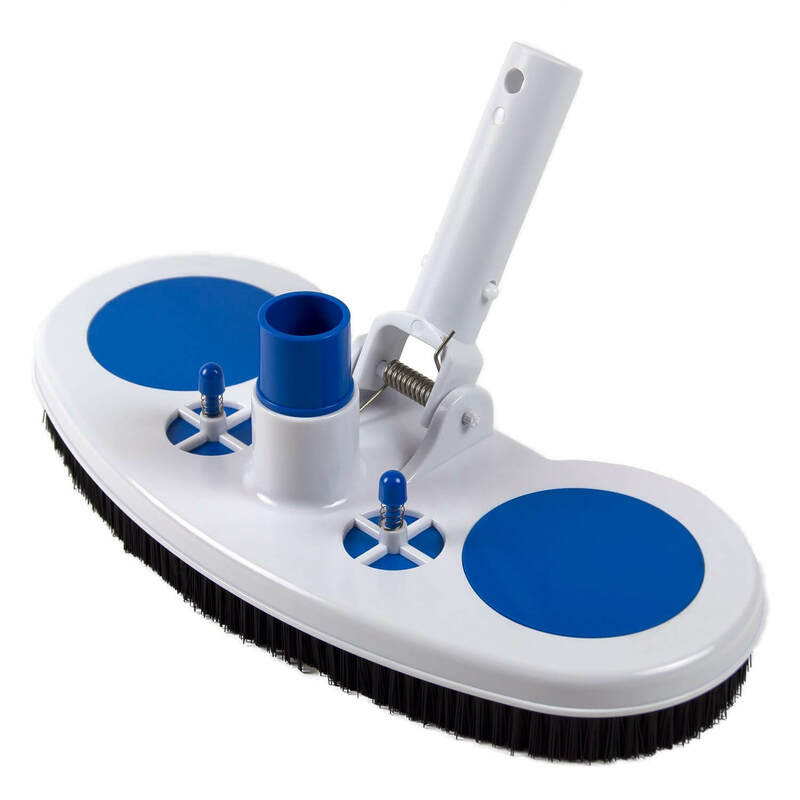 The above ground pool can also be cleaned using its 19-inch vacuum head. The flat- edge of the head can literally bend over the debris to collect all the dirt in pool floor. All the corners can be easily accessed. The Aluminium handle adapter easily attaches to the standard poles with the help of the spring-loaded locking clips. 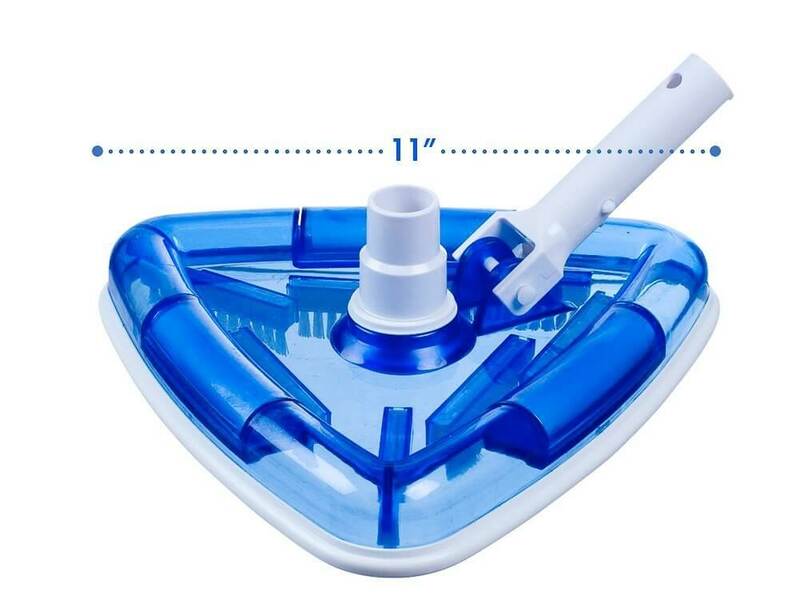 This comes with 1.5’ suction port. The Poolmaster 27400 Air Relief Vinyl Liner Vacuum is for Vinyl liner and fiberglass pools. The pool vacuum head comes with a stainless steel tension spring. This helps keep the vacuum submerged and level to the floor. It features two air- relief valves which are self – adjusting, for suction control created by the vacuum. The Vacuum Head is 13” wide and it works with 1.25” and 1.5” Vacuum hoses. Vacuum hose needs to be bought separately.